If you’ve always wanted a Segway but were holding out for a “personal mobility device” that lets you be even more lazy, you’re in luck. 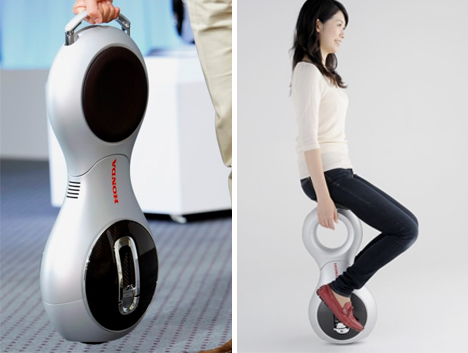 Honda recently gave the press a preview of the U3-X, a “modern unicycle” that drives like a Segway (you control it by leaning your body) but, unlike the Segway, lets you sit down while driving. And, unlike a unicycle, it’s battery-powered, meaning that driving it only requires you to sit down and lean slightly. It looks remarkably uncomfortable, and with a top speed of 4 miles per hour it wouldn’t be hard to walk faster than this thing can take you. But at 22 pounds, it’s light enough to load into the trunk of your car so that you can avoid any actual walking at all. As pointed out by Britain’s Daily Mail, this smacks of Wall-E-esque future laziness. Do we really need yet another device that allows us to be lazy? According to Honda, the unicycles are meant to be used by the elderly, who may have mobility problems. However, a unicycle steered by body weight distribution may not be the best solution for seniors who aren’t able to walk steadily. In fact, it seems almost intentionally dangerous. Regardless of the intended application, we have to admit that the technology behind this little thing is pretty cool. The single wheel is packed with multiple smaller wheels, making it possible to move in any direction. The movement looks very smooth and almost makes the user look like they’re floating. 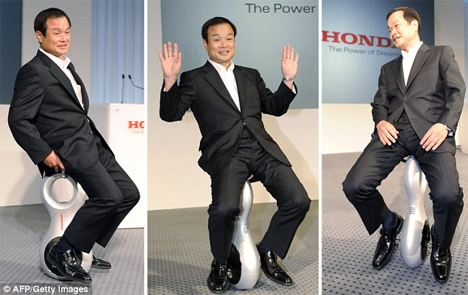 Honda Motors president Takanobu Ito says that the goal of the invention was to create the world’s smallest personal mobility device. As of yet, there are no manufacturing plans for the U3-X. See more in Bikes & Cycles or under Transportation. October, 2009.